Status : Warrior Cast Of The Gen Army. Description: Serving as guardians to the Gen, the Kavzar are extremely powerful beings that nearly rival the Warrior Guyver in raw power. After the failure of the Gaia project due to the Guyver Zoalord event it left a chasm in the Gen military. This was first partly filled by the Aceaer-Cast, the next step to filling that chasm was the Kavzar the replacement to the few remaining Zoalords. Based on the Control Unit Bio-armour and technology salvaged from the arm of the Warrior Guyver and the Zoalords of Earth, the Kavzar possesses both Guyver and Zoalord characteristics and make up the fist leader class of the Gen military and are used to control the vast ranks of the Aceaer Cast. Considering the resources needed to create a Kavzar, only those in the Aceaer cast that have proven themselves to be good warriors are allowed to become Kavzars. Once transformed into a Kavzar, these beings permanently remains in that form until either their death or advancement into an even more powerful form. Psychological Profile: The Kavzar class warriors are a genetically engineered race that was created to serve the Gen without question and with an almost religious zeal, making them the perfect warriors for the Gen army. A ranking system was adopted as each class of Kavzar going from standard Kavzar to Commander class to Enforcer class consumes immense resources. Each Kavzar strives to be promoted to the next class to ultimately be an Enforcer class as their religious devotion to the Gen this would give them a better purpose in serving them. Present estimates of these beings abilities have been compiled and summarized below. Subject’s physical strength has been estimated to be three times greater than a normal standard Guyver’s, granting the subject the approximate strength of 300 men. The subject is equipped with a advanced HSL (Hyper Space Link) power system and an improved regulating efficiency that gives subject nearly unlimited energy reserves by continuously siphoning energy from Hyper Space to maintain the process at peak efficiency, granting subject nearly unlimited energy reserves and stamina. The system is not as efficient nor as compact as the Warrior Guyver’s own HSL and has been shown to be momentarily drained until his HSL system catches up. However this system is so efficient that the subject does not need to rest or eat. Running speed is 600 MPH, with a sustainable max. of ~900 MPH under ideal conditions, and a max. acceleration factor of ~18 G’s. Flight is attained through gravitational control, just like a standard Guyver, but the subject’s superior power and armor technology lets the subject attain a flight speed of 1,875 MPH, with a sustainable max of 3,000 MPH with the use of the Blast Shield, and a max. acceleration of ~33 G’s. Reflex speed is 15 to 120 times human normal peak. The subject’s ability to access hyper space to physical send himself to and from hyper space and thus use hyper space to teleport himself almost anywhere he wishes at will. This ability can also be extended to whoever or whatever the subject is in close physical proximity to by creating a spatial warp that tunnels through hyper space and protects whatever is being transported from the intense energy filled hyper space, but unlike the subject’s normal teleportation this ability is limited to planetary distances. The tunneling effect of the spatial warp breaks down over longer distances and could thus expose whatever is being transported to the energy filled hyper space. Subject’s bio-armor is far more advance than a standard Unit’s, containing control medal like elements that make it not only more dense but far more stable and adaptable. Granting the armor with over twice the natural durability of a standard Guyver’s armor. The armor is not as efficient as a Warrior Guyvers can resist most biological attacks designed to break down bio-armor, but not become immune to it. Any damage sustained is also regenerated at a rate eight times faster than a standard Guyver’s norm. Defense is further augmented by a kinetic energy transfer field merged with the subject’s body shield that better allows the subject to withstand physical attacks by transferring the kinetic energy elsewhere. The body shield also allows the subject to withstand slightly less than a single mega smasher from a standard Guyver. The subject can produce a blast shield similar to the blast field that all Guyvers produce when they activate their armor that allows him withstand an attack of up to four times more powerful than a standard Guyver’s double mega smasher. The subject also has a zoalord force field that combined with the blast shield and his gravitational power to withstand up to thirty times the power of a standard Guyver’s mega smasher. However this has shown that power reserves do get severely strained and results in a temporary loss of shielding, leaving subject(s) open to conventional attacks, for several critical moments before the HSL system can compensate. The advanced link to the subject’s brain helps process the sensory information that provides the him with a kind of HUD (Head’s Up Display) or augmented perception. Providing the host with tactical information and keeping track of both friend and foe activity with ease. This combined with the 3D sensory orb system, grants the subject with a near omnipotent awareness of his environment. Since the hyper sensors can also sense through obstacles, within its active sensory range, it is nearly impossible to surprise the subject in battle. The range of the Hyper Sensors have been estimated to be approximately 300 meters (~984 Feet) for active perception and up to a fifty times that for passive perception. The Bio-Laser Orb that the subject possessed as an Aceaer was merged with the Kavzar Control Crystal that gives it the ability to fire an intense and efficient bio-energy and infrared beam that is ten times greater than a standard Guyver’s infrared beam. The subject can channel additional bio-energy through the beam for an effect ten times greater than normal but reduces the range of the weapon. The subject’s sonic weapon emitters are more advance than a standard Guyver’s, showing greater versatility and power. Radius of attack can range from 5 to 160 degrees and intensity ranges from a low hum to ten times that of a normal Guyver’s. The subject possesses a kinetic energy transfer field that can augment the sonic busters to be used in the vacuum of space. Subject possesses three pairs of vibrational swords, two spike like swords located forward on each forearm and one located on each elbow. Each sword is of much greater density than a standard Guyver’s and operate a much greater vibration range. In addition, the two pairs located on the subject’s forearms are integrated with the subject’s kinetic energy transfer field that allow the subject to enhance these swords up to a point where they can withstand even a Warrior Guyver’s polymorphic swords. The subject possesses a E.M. pulse device that fires small metallic projectiles at near the speed of light, on each forearm and can inflict considerable damage to any unshielded target. Subject can focus his gravitational power, just like a standard Guyver, and his kinetic transfer field to augment his physical mass momentum energy when performing a physical attack to magnify the power of a punch or kick by approximately three hundred fold. Combined with subject’s greater mass/density and speed, allows the subject to specially design impact absorbing armor with a single blow. The subject can generate and manipulate twenty times the gravitational energy of a standard unit, the pressure cannon is far more powerful than a standard Guyver’s. Allowing the subject to fire either a single massive Pressure Cannon, with up to twenty times the power of a standard Pressure Cannon or a triple pressure cannon with eight times the power of a standard Guyver’s each, or can produce a hail of approximately 20 per second, similar to a Zoalord’s gravity bullet attack, with half the power of a standard Guyver’s pressure cannon each. Since this weapon essentially focuses enough gravitational energy to fold space in on itself it can also be used defensively, if held and not fired, to refract even light around and away from subject. The subject possesses all of the gravitational powers of a zoalord such as the ability to produce a hail small gravitational energy balls approximately 20 per second each equal to a third the power of a Guyver’s pressure cannon. He can also fire zoalord hand beams from each of his palms with each beam twice as powerful as a Guyver’s pressure cannon as well as create Black Holes. The subject can create a powerful combination hand beam/gravitational/rail gun attack from his hands that is easily as powerful as a mega smasher level attack. 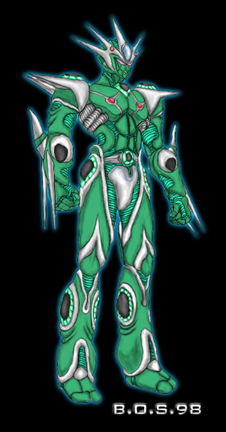 Similar to the Warrior Guyver’s, the subject can fire a beam five times more powerful than a standard Guyver’s and can maintain them for up to 10 seconds before needing to recharge the smasher cells. Subject’s HSL while inferior to the Warrior Guyver’s, is more than sufficient for the subject to fire them as often as he needs. The control crystal is similar to a zoalord’s zoacrystal in that stores energy and regulates zoalord abilities of the subject but has been greatly enhanced to possess a control medal like interface that controls and regulates all of the subject’s Guyver-like abilities. Combined with secondary control medal like elements throughout the subject’s body allows nearly absolute control of the armor without it going rogue. The control crystal has amazing damage control capabilities that allows even if completely shattered for each remaining piece to come back together and repair the damage. So great is this damage control capability is that at least 75% of the control crystal has to be destroyed for the subject to be killed.